Sailors use two kinds of batteries; one is called "cranking battery" and the other is "house battery." Both of them have the same voltage of 12V, which is equal to those of most car batteries. Actually, the cranking battery is just the same as a car battery except for the price. Everything for boaters is ten to twenty percent more expensive than car devices. As the name implies, the cranking battery is mainly used to start the engine because it has a characteristic of producing high power for a short time. On the other hand, in terms of the house battery, it can produce power moderately but lastingly. 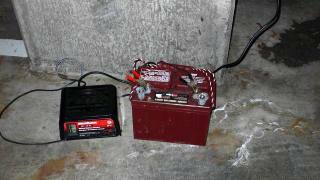 It is sometimes called "deep cycle battery" and has the feature of less discharging. As my boat needs no starter motor I have only deep cycle battery. I was surprised when I tried to charge it, because it had still 70% of energy though I charged it last more than one year ago.